The 10 steps small- and medium-size business owners need to take before starting a website redesign to ensure future success and substantial ROI. Sound familiar? If so, you aren’t alone. However, as a small business owner, what you do next will determine the success or failure of your redesigned website—even before a pixel is created for the design or a line of code is written. In our experience, which spans hundreds of website redesigns over the past 19 years, most business owners don’t take the time to articulate their website goals prior to beginning a redesign. Instead, they simply react to the desire of wanting one. This is a dangerous scenario that could impact future success, and should be avoided. Strategy is key! To successfully redesign a website, it is essential to understand (1) why you need to, and (2) what you need the redesign to accomplish. When these two questions are answered, it is easier to redesign and implement a site that meets these needs—and exceeds your goals. Did you just wake up one day and start your business? It’s unlikely. Instead, you spent months, or even years, developing a business plan. And while it will not take years to redesign your website, it requires the same careful attention as your business plan. Proper planning helps you make efficient use of your budget, and ensure that your website provides you with substantial ROI. After all, isn’t the goal to make money? A redesign can be a huge success—or it could fail terribly. That is where checklists can make your job a whole lot easier, and ensure future success. And that’s exactly what our 10-Step Website Redesign Checklist solves: providing every step you need to turn your website into a marketing machine for long-term success. 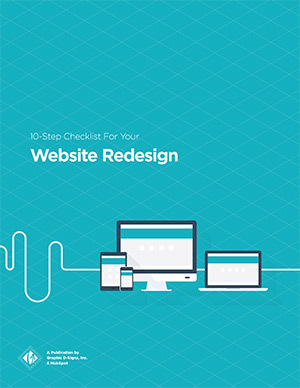 Simple and comprehensive how-to instructions to complete each of these steps are all detailed in a new, in-depth whitepaper: “10-Step Checklist for Your Website Redesign”. Created as a collaboration between HubSpot and Graphic D-Signs’ Danielle Massad, Mehgan Recker and Vin Ferrer, this free PDF download also offers insights and examples from our team of experts. Click here to access “10-Step Checklist for Your Website Redesign”.